Getting fresh air is important, so here are some tips on how to improve your home’s indoor air quality this winter. Now that winter is almost here, you probably won’t feel like going outside as much. You’d rather stay inside your warm home. Unfortunately, that indoor air can quickly grow stale. Getting fresh air is important, so here are some tips on how to improve your home’s indoor air quality this winter. You might not know this, but adding houseplants can improve your indoor air quality. For one thing, the plants you bring into your home can actually help to purify the air. They’ll absorb the carbon dioxide and produce more oxygen, which will help you focus and think better, especially if you spend the majority of your time working from home. Aloe plants, English Ivy, and bamboo palms are all relatively low-maintenance options. The next thing you will want to do is to increase ventilation and circulation. The more ventilation you have, the better your circulation will be, which will help to improve your indoor air quality. Old homes usually have ventilation problems, but newer homes aren’t immune. It can also be beneficial to clean up your floors and place doormats in front of every door in and out of your home. 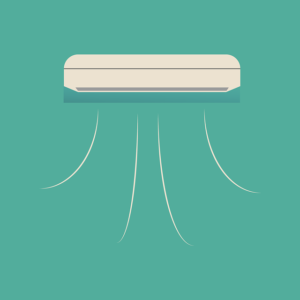 Changing air filters is one of the best ways to improve indoor air quality. Follow manufacturer instructions on how to do this. Dirty air filters will only make the indoor air quality in your home decline. Clogged air filters will also make your residential HVAC unit have to work harder, which will cause your utility bill to go up. The dry conditions in winter will make you want to use humidifiers. While you should add some humidity, you can’t overdo it. On the other hand, if your home is too humid it can encourage the growth of mold and mildew, so use some dehumidifiers to keep a balance. This entry was posted on Friday, November 30th, 2018 at 9:03 am. Both comments and pings are currently closed.